The report admits that HRW did not have physical access to the site and had based its study on Skype interviews with ‘More than 10 witnesses and survivors’ made over a period of two weeks between 22 August and 6 September. These were supplemented by video and photo footage and other data from an unnamed source or sources. Mr Jenzen-Jones’s LinkedIn profile does not list any training or experience with armaments, and his only qualifications appear to be ‘certified armourer and ammunition collector’ – which probably relates to the Firearms Amendment (Ammunition control) Act 2012 of the state of New South Wales, Australia. In reports on the story on his own blog ‘The Rogue Adventurer’, Mr Jenzen-Jones relies on data taken uncritically from sources such as the New York Times and even a Los Angeles Times article based on Israeli intelligence Apparently he is not familiar with Israeli falsified reports such as the alleged use of guns by passengers on the Mavi Marmara against Israeli commandos (which remain uncorroborated despite Israeli forces seizing virtually all photographic data from the more than 600 passengers, along with film from security cameras located throughout the ship and Israel’s own constant infra-red surveillance from boats on both sides of the ship and at from least two aircraft). As former CIA director Stansfield Turner is alleged to have said, Mossad excels in PR, and not in intelligence. HRW’s other expert, Eliot Higgins is an untrained analyst who was recently talked-up into some kind of expert by Matthew Weaver in the Guardian. On his Brown Moses Blog of 28 August 2013 Mr Higgins featured a video sent to him by a source allegedly showing the type of munition linked to the chemical attacks being fired close to Al-Mezzah Airport near Daraya. The video has been filmed at some distance and none of the upwards of 20 men roaming around the site can be clearly seen. An unmarked Mercedes semi-trailer lorry apparently delivers the rocket which is loaded (this is not seen) onto an unmarked white rigid lorry on which the launcher is mounted. The men aimlessly roaming around are mostly wearing army fatigues, although others, including some on the launcher, are in civilian clothes. A number of those in military uniform are wearing red berets. Based solely on this headgear, and the fact that the Syrian Republic Guard as well as the military police are issued with red berets, Mr Higgins is emboldened to state that ‘…this video shows the munition being used by the government forces […]. Stills taken from the video analysed by Eliot Higgins. Mr Higgins has deduced that this is a Syrian Army operation entirely from the red berets worn by some of the personnel. The rocket shown can also carry conventional explosives. In a previous posting on 26 August, Mr Higgins estimated from shadows that a rocket shown in photographs between Zamalka and Ein Tarma had been fired from north of the site, and he set about trying to locate the launch site with the help of correspondents. Hoping to find the exact location, he speculated that the 155th Brigade missile base was a possible site for the crime. This line of investigation quietly disappeared after the UN Mission reported that the missile they had examined at Zamalka/Ein Tarma was pointing precisely in a bearing of 285 degrees, i.e. nearer west than north. Meanwhile Mr Bouckaert in his report two weeks later reported that two of his witnesses told HRW that the rockets came from the direction of the Mezzeh Military Airport. These accounts also became inconvenient later when, as we shall see, HRW seized on the azimuths provided by the UN Mission and dashed off on a new wild goose chase. Apparently HRW now considered that nearly 20 per cent of the ‘witnesses and survivors’ it had interviewed were no longer credible regarding the direction of the rockets. The ‘evidence’ produced on p20 of the report amounts to nothing more than supposition. Mr Bouckaert merely states his skepticism that the rebels could have fired surface-to-surface rockets at two different locations in the Damascus suburbs; he asserts that the types of rockets thought to have been used are not reported to be in possession of the opposition nor is there any footage showing that they have mobile launchers suitable; and he states that the large amounts of dangerous nerve agent would require sophisticated techniques beyond the capabilities of the rebels. No actual evidence is cited to show that this weaponry is Syrian Army equipment. On the contrary the Soviet 140 mm rocket referred to on p15 requires a BM-14 rocket launcher, first produced in the late 1940s. The Syrian Army equipment list produced by Global Security shows none of this obsolete weaponry in stock but instead lists around 300 of the BM-21 launcher which replaced it. The BM-21 launches a 122mm rocket, so the Army would be unable to fire the 140mm rocket that rebels found and the UN Mission inspected at Moadamiyah. Mr Bouckaert might also recall that Israel has a common border to Syria and is known to have stocks of sarin amongst the vast collection of illegal chemical and biological weaponry amassed by the Israel Institute for Biological Research (IIBR) at Nes Ziona. 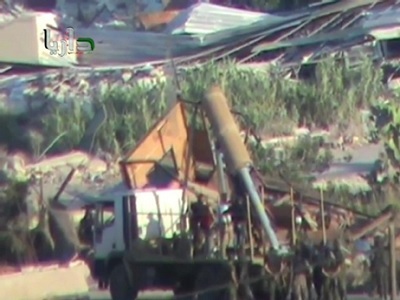 YouTube videos also show Syrian rebels in possession of mobile rocket launchers. HRW really did assemble a Mickey Mouse team of researchers when they cobbled together this report. Nevertheless HRW’s reputation and distribution ensured that their allegation was distributed by agencies such as Associated Press and reported by outlets which included the BBC, CBS, New York Post and other international media such as the Tasmanian newspaper The Examiner and the Jakarta Post None of these outlets questioned the veracity of this very serious allegation against the Syrian Army. On 11 September, a day after the HRW report was published, the International Support Team for Mussalaha in Syria published its unique and important analysis of documentation nominated by US intelligence. Having carefully and thoughtfully analyzed the data, including a number of images also published in the Bouckaert report, the study discovered not only widespread manipulation of evidence, but in the tradition of BBC reporting in Syria, they also discovered that photographs of victims in Cairo had been described as victims of a chemical attack in Syria. This preliminary study concludes that there has been gross media manipulation and calls for an independent and unbiased International Commission to identify the children who were killed and try to find the truth of the case. This writer has not seen any HRW document which refers to the ISTEAMS study. The UN Mission report was published six days after the Bouckaert report on 16 September. This disclosed that the Mission had been allowed a total of only seven-and-a-half hours on-site in the two suburbs which are both located in opposition-controlled areas. During that period they had experienced repeated threats of harm and one actual attack by an unidentified sniper on 26 August. Nevertheless they had collected samples and ‘a considerable amount of information’ along with ‘primary statements from more than fifty exposed survivors including patients, health workers and first-responders.’ In fact the statements had been taken in interviews with nine nurses, seven doctors and 36 survivors. The Mission concluded that there was ‘definitive evidence of exposure to Sarin by a large proportion of the survivors assessed’ and it stated that it had been informed that victims began suffering effects following an artillery barrage on 21 August 2013. All interviews, sampling and documentation followed procedures developed by the Organization for the Prohibition of Chemical Weapons and the World Health Organization. The report states that ‘several surface to surface rockets capable of delivering significant chemical payloads were identified and recorded at the investigated sites’ but only five impact sites in total were investigated by the Mission (presumably because of the time constraints imposed on them by those who controlled the areas). The UN report is not without its contradictions. In a summary in their Letter of Transmittal the authors wrote ‘In particular, the environmental, chemical and medical samples, we have collected, provide clear and convincing evidence that surface-to-surface rockets containing the nerve agent sarin were used in Ein Tarma, Moadamiyah and Zamalka…’. And yet none of the 13 environmental samples taken from Moadamiyah were found to have any traces of sarin, although one of the two laboratories conducting the analyses found degradation products of sarin in four of the thirteen samples while a further sample was found to contain degradation products by the other lab. Although two of the samples were unspecified metal fragments, none of the samples was specifically described as being part of a rocket. Does the discovery of degradation products in 38 per cent of the samples (and only 23 per cent of the tests) along with a complete absence of the chemical agent itself constitute ‘clear and convincing evidence’ that Moadamiyah was attacked by surface-to-surface rockets containing sarin? Once again no supporting evidence was provided to explain why HRW blames the Syrian Army, and all previous locations suggested for the launch were conveniently forgotten. To recap, Peter Bouckaert reported two witness statements that the rockets came from the direction of the Mezzeh Military Airport (more than 6 kilometres from the Republican Guard base) and HRW’s ‘expert’ Eliot Higgins was convinced that they were fired from north of the target sites. Referring to unspecified ‘declassified reference guides’ Mr Lyons tells us that the 140mm artillery rocket could have reached Moadamiya, 9.5Km from the Republican Guard’s base. Yet even if a seventy-year old rocket system could indeed fly that far, Mr Lyons is forgetting that the Syrian Army no longer has these outdated systems. It therefore no longer has 140mm rockets, one of which is alleged to have been responsible for part of this crime against humanity. He is also forgetting that no actual chemical agent was found at Moadamiya, so it is premature to start producing cross references from that site. And above all he is deliberately omitting to tell his readers about the caveats written for both target sites by the UN inspectors that clearly and unequivocally suggest that the evidence has been tampered with at both sites which are located in opposition-controlled areas. None of these inconvenient truths have stopped the HRW juggernaut. On 20 September the Guardian published an article by HRW staffer Sarah Margon promoting both the Bouckaert report and the Lyons’ calculations (apparently unaware of the contradiction between the two). She ended up by calling for an Obama/Kerry commitment to ensure there is ‘accountability for those who would use the world’s most heinous weapons against the world’s most vulnerable people’. But of course she was not writing about Fellujah or Gaza or the IIBR at Nes Ziona.